Nutrisystem or Jenny Craig: Which Diet is Right for You? Nutrisystem and Jenny Craig are two of the most popular diets around, and at first glance they sound pretty similar: Both deliver pre-made, pre-calorie-counted, pre-everything meals to your door. Both offer online tools and one-on-one support. Both offer plans designed to fit your lifestyle and your health challenges. Both have celebrity spokespeople singing their praises. But there are also some definite differences between the two plans. Paying attention to these can help you choose which will work best for you. Both Nutrisystem and Jenny Craig provide customized diet plans to fit your taste and your needs with calorie and nutrition consumption backed by research. Food options range from traditional to more exotic faire, with plans including pre-made meals from breakfast to dessert. Nutrisystem allows for substitution of other groceries; Jenny Craig requires adding fresh fruits, vegetables and dairy. Support communities surround both plans: Nutrisystem offers virtual options including interaction with a counseling team via email, chat, or phone and Jenny Craig has brick-and-mortar locations for in-person support. 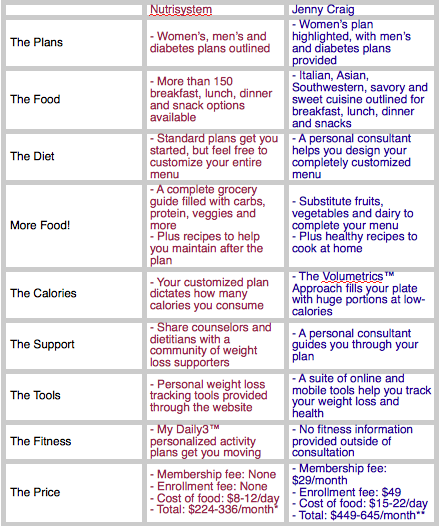 Perhaps the cost is the greatest difference: While Jenny Craig requires an enrollment fee and monthly membership fees on top of the cost of food, Nutrisystem only asks you to pay for your food, which varies in prices from plan to plan. Jenny Craig also costs more a month for food alone. However, Nutrisystem requires dieters to enroll in auto-withdrawal for their plans, which might not be an option for dieters on a budget. That said, Nutrisystem, is available in many Wal-Mart stores for approximately $50 a week. *As quoted on Monday, May 19, 2019, by Nutrisystem representative. Month consists of a 28-day cycle. ** As quoted on the website on Sunday, May 11, 2019. Month consists of a 28-day cycle.